With just a couple of more days to go, all eyes are on Huawei as the company gears up to launch its flagship camera smartphones, the P30 series. The design and many of the main key features have been heavily rumoured so far, so all that really remains is the pricing. 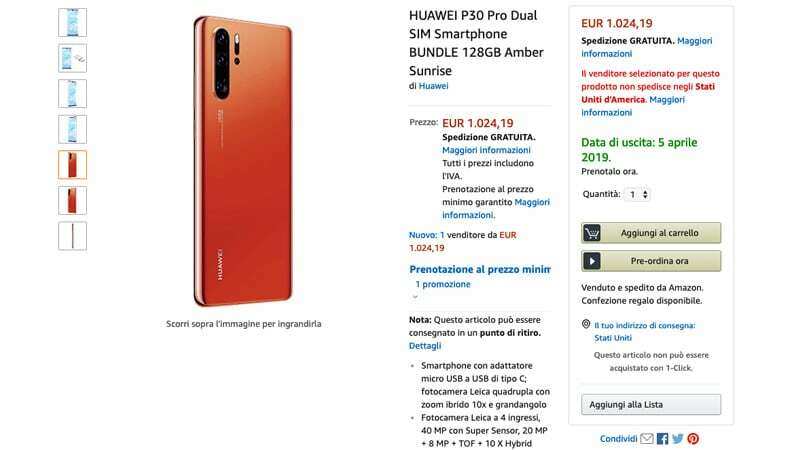 Just days before the launch, Amazon Italy accidentally put up a listing for the Huawei P30 Pro, which pretty much bares all the information we’ve been waiting for. The listing was taken down immediately but clearly not fast enough to avoid itchy screenshot fingers of fellow tech enthusiasts. Italian blog HDBlog managed to get some juicy screenshots of the Amazon listing, ripe with all the specifications, press images and pricing, as reported by Android Police. The listing is of the 8GB version with 128GB of internal storage, carrying a price tag of EUR 1,024 (roughy Rs. 80,000). If this pricing is indeed accurate, then this lines up well with previous rumours that suggested the P30 series would be more expensive than the P20 series. This also makes it more expensive than the Samsung Galaxy S10+, which starts at Rs. 73,000 in India. The Amazon listing also confirms a couple of other interesting facts about the upcoming phone. The P30 Pro will have 40-megapixel primary sensor, 20-megapixel and 8-megapixel sensors (one of them a wide-angle while the other, a telephoto), and a TOF (Time Of Flight) sensor for gathering depth information. The specifications also reveal that the P30 Pro will have a 32-megapixel selfie camera. Other specifications reportedly confirmed include the presence of USB Type-C, EMUI 9.1 based on Android 9 Pie, Kirin 980 SoC, 4,200mAh battery, and dual-SIM support. We’re also seeing a new ‘Amber Sunrise’ colour option for the first time, which looks interesting. The P30 Pro will weigh around 191grams and measure about 8mm in thickness. Huawei seems to be heavily banking on the camera prowess of the P30 Pro, but would that be enough make the P30 Pro a success in India especially with that hefty price tag? There’s no doubt that this phone will compete directly with the Samsung Galaxy S10+, which has already proven to have an excellent set of cameras. We’ll just have to wait a bit more to find out.